Käthe Kollwitz, Lene Voigt, Clara Zetkin… most of us living in Leipzig will encounter some of these names almost every day. But how much do we actually know about the renowned women who give some of Leipzig’s streets and parks their names? Prints and drawings by Käthe Kollwitz will be on display at the National Gallery of Ireland in Dublin. The German artist created almost 300 prints, approximately 200 sculptures, and some 1,450 drawings during her lifetime. “Käthe Kollwitz: Life, Death and War” will bring her work to the Irish public for the first time. The exhibition features 38 prints and drawings from the Staatsgalerie Stuttgart, along with two lithographs from the National Gallery’s own collection. Her artwork on display focuses on war and, in particular, the grief felt after the death and destruction caused by it. Kollwitz was born in 1867 in Königsberg, Prussia (today Kaliningrad, Russia) and died in 1945 in Saxony. She lived through some of Europe’s darkest moments. Her print works, focusing around different periods of the early 20th century, mark her as one of the foremost printmakers of her time. These dark, moving prints can be seen as a poignant plea for the abolition of war and oppression for the sake of future generations. The exhibition will be accompanied by a series of lectures, concerts and film screenings supported by the Goethe Institute Dublin. At the opening of the event, the German Ambassador to Ireland, H.E. Matthias Höpfner, noted the exceptional life of the artist. For example, she was invited to become the first ever female professor at the Prussian Academy of Arts. However, her life was tormented by death and war: Kollwitz lost her son Peter in the early days of World War I and lost her grandson in World War II. These events would influence her artwork, in which she sought to show the suffering and pain of the people in war zones and at home. 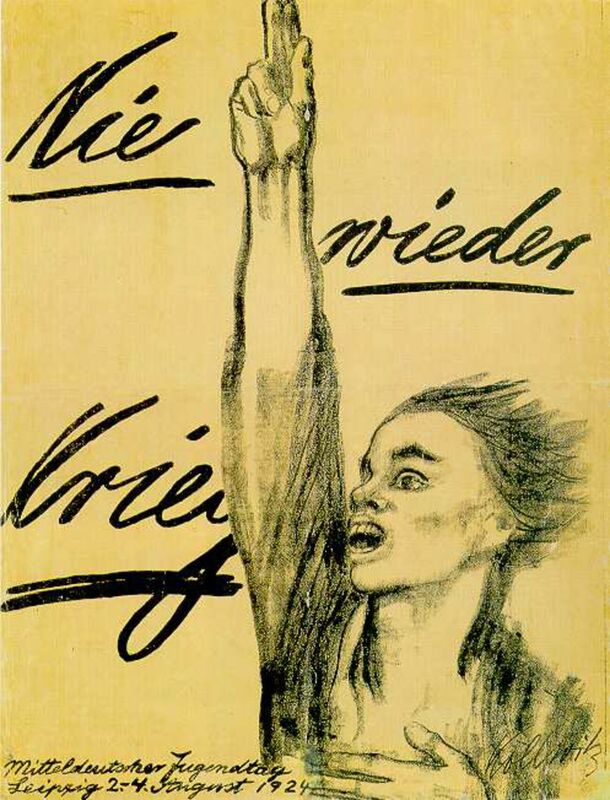 She became a pacifist following the death of her son and created the well-known “Nie wieder Krieg” anti-war poster. “These are values that Käthe Kollwitz would have shared wholeheartedly,” he said. In light of recent developments such as Brexit and the rise of Euroscepticism across several EU countries holding great influence, his words are even more poignant. His Irish audience no doubt appreciated his nod to what cooperation and solidarity with Europe have done for their country. The exhibition will run at the National Gallery of Ireland until 10 December. Entry is free. You can fly from Berlin to Dublin with the infamous Ryanair for as little as €28 in November and December.